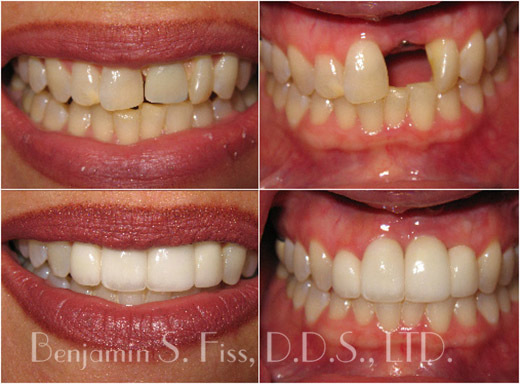 Dental Implants - Chicago | Benjamin S. Fiss, D.D.S. Missing teeth are more than a cosmetic embarrassment; they can slowly deteriorate the overall health of your mouth. Your teeth play a vital role in keeping your jawbone strong and healthy. The bone atrophies over time in areas with missing teeth, resulting in a weak jaw and a sunken appearance. While dentures and bridges can fix the cosmetic issues associated with missing teeth, they do not prevent eventual jawbone degeneration. Dental implants are the permanent solution to missing teeth, restoring both your smile aesthetics and preserving the integrity of your jaw. Dental implants are placed through a multi-step process to ensure implant longevity and natural-looking results. Local or general anesthesia may be used during your procedure to reduce pain and provide patient comfort. While the exact timeline of your treatment can vary depending on the extent of correction you require, most patients will follow these steps. Step One: The titanium implants (that look similar to screws) are placed into the jawbone. A temporary covering is fabricated to ensure the aesthetics of your smile while the jawbone attaches itself to the implant. This process takes three to six months and is called osseointegration. Step Two: Once the implants are fused to the bone, custom abutments are fabricated and attached to the implants and project through the gums. A temporary implant crown tooth is placed over the abutment to maintain your smile while the implant crown is fabricated in the lab. The gums will require several weeks to heal before your final implant crown can be placed. Single tooth implant replacement…from start showing the hopelessly decayed ( gray) tooth to its removal and placement of a custom temporary . Once the implant was placed and healed a custom zirconia ( tooth colored) abutment was screwed down to the implant and a very translucent and natural all porcelain crown was cemented creating a lifelike result. Patients who are missing the majority of their teeth may find that dentures don’t provide them with the comfort and functionality of their original teeth. The All-on-4 treatment is an effective solution for patients missing the majority of their teeth. All-on-4 treatments replace your missing teeth with a full dental bridge supported by only four dental implants. The unique All-on-4 treatments ensure bone stability while maintaining the functional ability of your teeth. 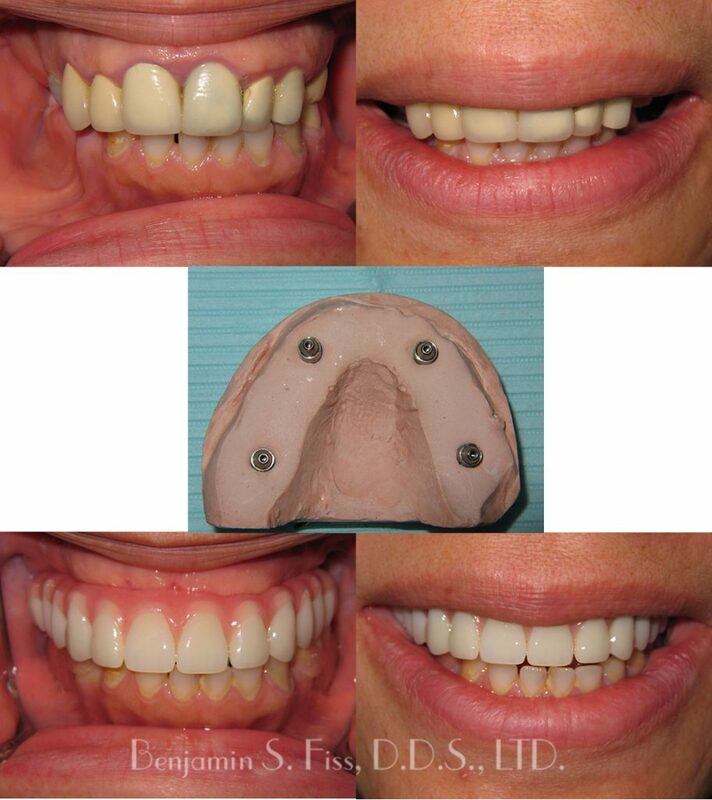 These 2 photos give an overview of the life changing effects implant and reconstructive dentistry play in a persons life . 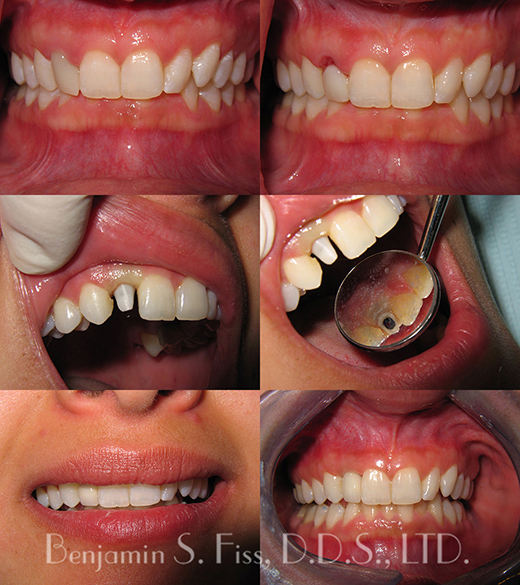 The before and after pictures are of a young woman born without teeth on top and missing some permanent teeth in the lower. The first picture demonstrates this -as she presents with a full upper denture and lower malposed and poorly shaped dentition. 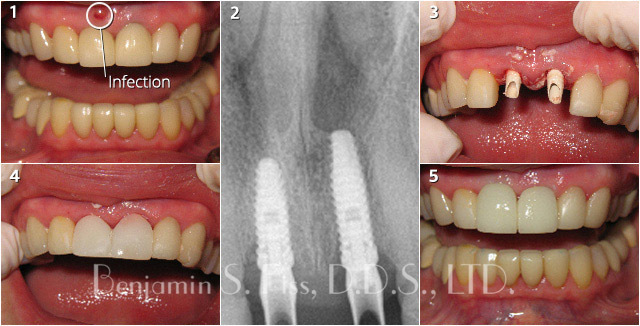 4 implants were placed in the upper arch after which a hybrid “all on 4” appliance was screwed into place. 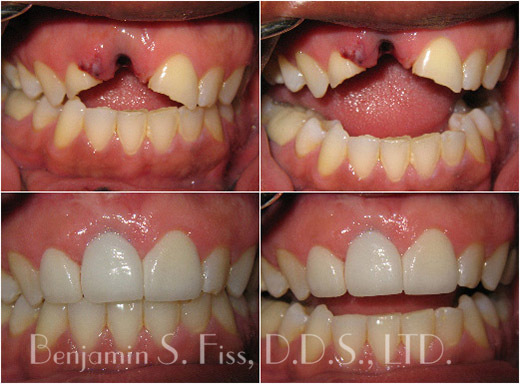 To restore the lower arch 3 implants and 12 porcelain crowns were placed. This restored the patient’s function and cosmetics creating a lifelike result. Maintaining the quality of your dental implants plays an important role in achieving long-lasting results. You should visit your dentist for cleanings four times per year. Proper at-home hygiene, including brushing and flossing, is important to maintain your oral health. Wearing a night guard to prevent bruxing, or grinding, will protect both implants and natural teeth from breaking down. Vigilant care will ensure the longest-lasting results possible. Many patients will choose to undergo the ZOOM!® Teeth Whitening process to achieve whiter, brighter teeth during the implant process—once fabricated, the implant crowns will not change color. Teeth whitening prior will ensure that all your teeth are the same color, which provides more natural, flawless results. If you are looking to permanently replace your missing teeth, schedule your consultation with Dr. Fiss today. 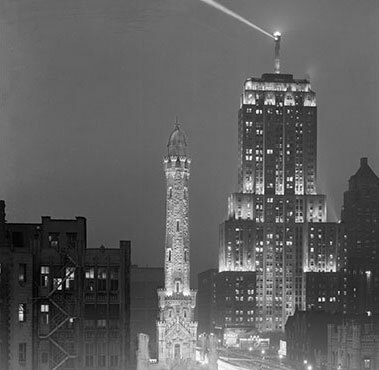 Call us at (312) 951-5230 or contact us online. 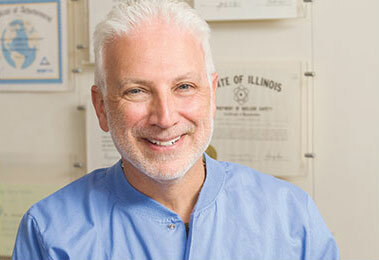 Interested in learning more about Chicago dental implants? We have all of the information that you need in order to make an informed decision about the future of your smile. With everything from implant history to videos and FAQ’s, you will learn the A to Z’s of prosthetic dentistry in Chicago and how it may benefit you. Photo 1: Patient presented with fractured and infected central incisors teeth numbers 8 & 9. Photo 2 & 3: Demonstrate X ray where hopeless patient’s 8 & 9 teeth were extracted, implants were placed with immediate temporary abutments. Photo 4: Temporary implant crowns were placed the same day. The patient was instructed to be careful eating. The temporaries were worn for 3 months until the implants integrated in the bone. Photo 5: Once integrated the final porcelain crowns were cemented, note how healthy the tissue is and how real everything looks. 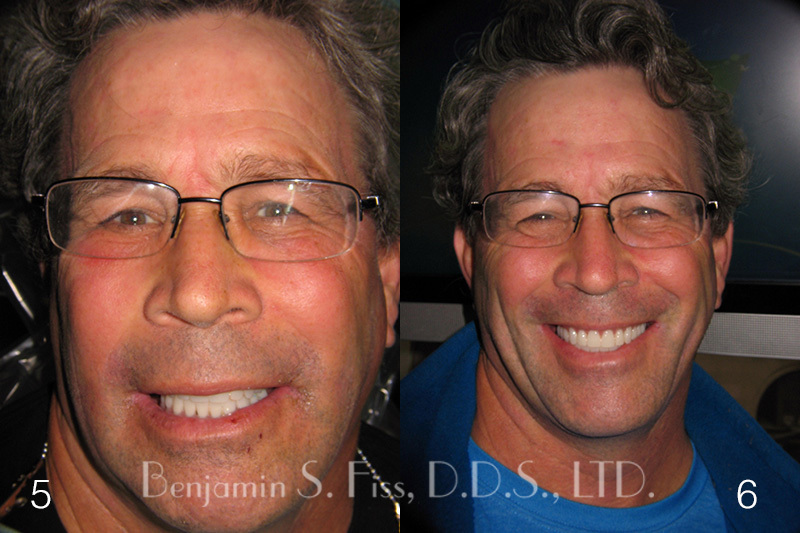 One implant and four all porcelain restorations changed this persons life from being afraid to smile to smiling constantly. Before and after implant dentures were placed improving the vertical dimension and lip contour creating a youthful natural result. 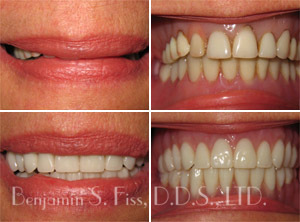 Patient went from smiling without teeth being present to a beautiful smile. 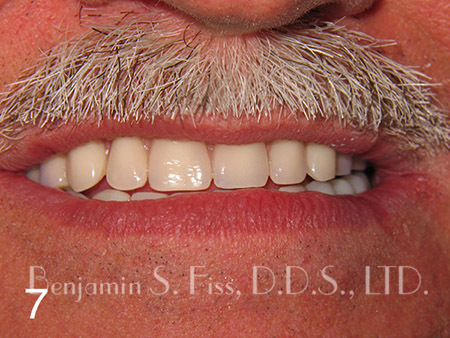 Photo #1 Patient presented with 18 hopeless teeth that required attention. Photo #2 Patient suffered from poor spacing, tooth damage, as well as severe bone loss. Photo #3 18 teeth were extracted and 8 implants were placed the same day. 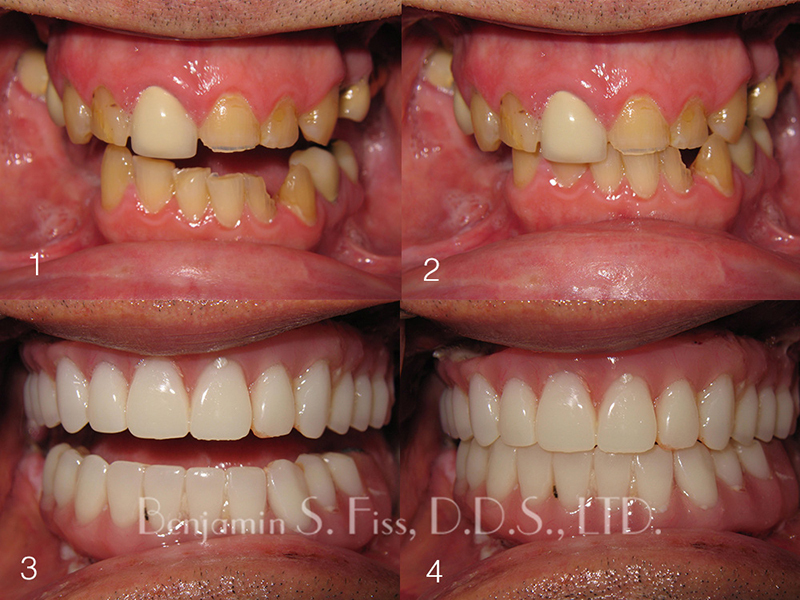 Photo #4 Tooth restoration was achieved through a hybrid, All-on-4 implant prosthesis placed the same day as the extraction.